The “Ready Shovel” – Very Simple, yet Very Cool. It’s been a few months since I started using it, and I now consider it part of my standard equipment, keeping it tucked inside my backpack with my other essential detecting gear. Maybe I’m coordinationally challenged, but it’s always been difficult for me to carry my machine & shovel together while walking or hiking long distances to a site. The shovel never stays straight and it hits my machine, making unnecessary noise. I switch from side to side, then I have the shovel in one hand, and my machine in the other, then they’re over my shoulder, but that hurts, so its back to both in one hand, because I always like to have one hand free–then the same scenario repeats over an over until I get to the site. But with the Ready Shovel in its holder, and my gear in my backpack, all I have to worry about is carrying my machine. It’s usefulness became oh so apparent the day I forgot it and was annoyed at having to carry my T-handle around all day. This also happened to be the day I found a neat old cast iron grill on the top of a mountain. I wanted the grill (it will make a nice planter in my garden), but was faced with carrying the three piece, heavy grill down the mountain–along with my machine and shovel. There was no way I was going to leave my machine, so I trudged down the mountain, machine, shovel and three piece cast iron grill doing a juggling act. It was a slow process, and I was swearing out loud for not having the shovel holder. It would have alleviated carrying at least one item, and would have been especially handy at a time like that! The Ready Shovel is very simple, yet very cool, and not only is it simple and cool, but its manufacturer is also (well the manufacturer is cool, not simple, but you get the idea)–and to spread the word about the Ready Shovel, the manufacturer has donated one to DetectingDiva to give away–and that is very cool! Second, you must be a subscriber to this blog. If you’re not a subscriber, its easy to become one. Just enter your email address at the top left where it says “subscribe to this blog via email”, and click on subscribe. If you’re worried about me sharing your name or email, I won’t, so don’t worry. Third, and lastly, fill out the form below with your name, email (a good one where you can be contacted for your mailing address if you win), type Ready Shovel in the comment section and click submit. Now if you want to write a note about why you want to win, or need to win this cool new product–because folks always do that, that’s fine, I appreciate the enthusiasm, but it won’t help your chances any. Every entry received gets printed, folded, and put in the raffle box. A winner is then picked randomly, by a very scientific formula, which is me shaking the heck out of the box, and having someone else reach in and pull out an entry. A winner will be picked on May 31st, 2015, at 8pm EST, from all entries received. The winner will be announced on this site, and contacted by email. Winner has three days to respond. Should the winner not respond within three days, and alternate winner will be drawn. For those of you wanting to purchase a Ready Shovel, you can order at their website www.readyshovel.com. It should be made clear to the casual reader that the item is not a shovel, rather it is a shovel holder. Thank you for the comment Piers. 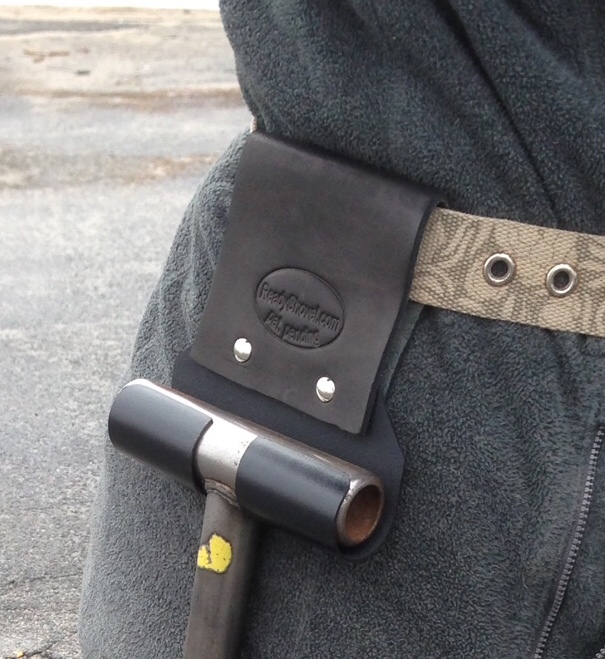 The name can be deceiving, that’s why I described it in the first sentence as “a belt carrier for a T-handle or D-handle shovel”. Pretty cool, but I don’t use a shovel. Does he make a “beer belt”? Ha ha–not that I know of, but wouldn’t you really rather have a belt that carries a bottle of wine? Not sure you would have a use for it but you can also use the T-Handle shovel carrier with a T-handle corkscrew! Nice video–thanks for the link! This is awesome! me and todd do some brutally long hikes and I can relate to your story about carrying it and having it hit your machine during the hike. I would utilize one of these for sure!